Seeing is Believing This sample manual to teach Active Listening is in MS Word format. Active listening is a key skill that everyone needs, so why not add this excellent one-day workshop to your training library? We've designed a comprehensive, customizable course that will help students develop this essential competency. 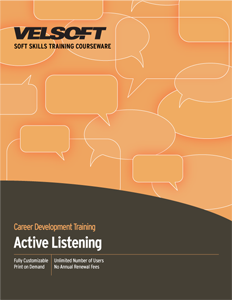 These active listening training materials cover techniques like building rapport, listening for cues, monitoring Active Listening, using empathy, and paraphrasing techniques. We've included a range of activities that will help students practice these essential skills. As well, we've created everything you need to train, including an instructor's guide, handouts, student manual, PowerPoint slides with custom graphics, and much more. Call us today and we'll set you up with a sample of this active listening course. If you're interested in online or blended-learning opportunities, just let us know - we offer eLearning too!